CM Magazine: The West is Calling: Imagining British Columbia. The West is Calling: Imagining British Columbia. Sarah N. Harvey & Leslie Buffam. Illustrated by Dianna Bonder. On 19 November, 1858, the mainland colony of British Columbia came into being. This year's celebration of the 150th anniversary of that event has spurred the publication of books like The West Beyond the West (Jean Barman) and Daniel Francis' Far West: the Story of British Columbia. The West is Calling is a picture book for the occasion, presenting snapshots of British Columbia history which feature places and periods deemed to be of importance. Our look at British Columbia's history begins in a Haida village and covers, among other things, the Cariboo gold rush, the building of the railroad, Emily Carr and the spirit bear before coming back full circle to the same native settlement in the present day. Oaks and blue lilies make way for fences and roads. are the lines superimposed over a busy scene of digging and building. In the background is a tent village, an expanse of ocean, and a sailing ship at anchor. The text is brief to the point of being terse, and the ideas presented are definitely only discussion starters, not complete information. At the back of the book, there are two pages of historical notes which do expand on the main matter. There is also a "Seek and Find" list of the details in each picture. The West is Calling is the first book for both of the authors. 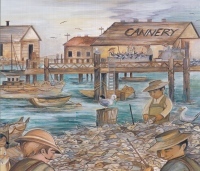 Illustrations by Dianna Bonder, who was the artist for the British Columbia Summer Reading Club in 2004, are mainly in blue, brown and tan, and contain humorous touches. There are a few nods to ethnic minorities and First Nations people, but Bonder's human figures are uniformly somewhat squat with horizontally ovoid faces. 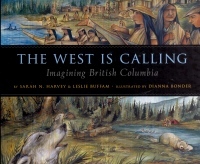 The West is Calling has a place in most school and public libraries, especially in BC. Ellen Heaney is Head, Children's Services at the New Westminster Public Library, New Westminster, BC.